Would like May visit Barcelona in Spain?? I'll be so glad to give her a touristic guide...! And my Julia will have a little friend for 2 weeks! 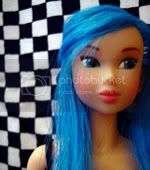 On the spanish forum we have a travelling blythe and it goes perfect, I think! Is it possible? mms0131 and sunflowered, you've been added to the list. OOOH! Thanks! We're sooo happy! Bump for a new signup sheet! I'd do it too! Winter in the northeast (as in Connecticut) is beautiful! Anyone else want to host? I'd love to host her again sometime next year. If no one else signs up soon she'll just be mailed back to me 'till we can get the ball rolling again. How many are needed for this to work? There needs to be at least one person next in line to host at all times. If not, the current host will have to either keep my until someone else steps up, or they can send her back to me and I van keep her 'till the next host. Hey Sunflowered, has May arrived yet? she has arrived today! We are very happy to have her at home, finally.